Par Aide's regulation golf flags are engineered to maintain their good looks despite long exposure to wind and sunlight. Improved steadfast colors, thanks to a patented DuPont® process. Lightweight 200 denier nylon construction makes flags sensitive to even gentle breezes, giving golfers a better determination of wind direction. Unlike heavy sailcloth flags, Par Aide's flags minimize premature wear on sticks and cups, and decrease the chance of flagsticks being blown out of cups. 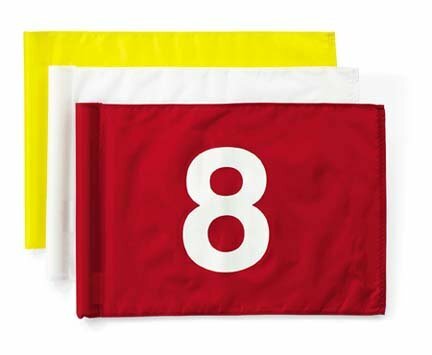 Golf Flag Set - Red and White Flag #'s 1-9 14 in. x 20 in.